Seriously, it’s the last day of September? This is crazy talk. And just like that the Month of Vegan Food is drawing to a close. sniff, sniff. 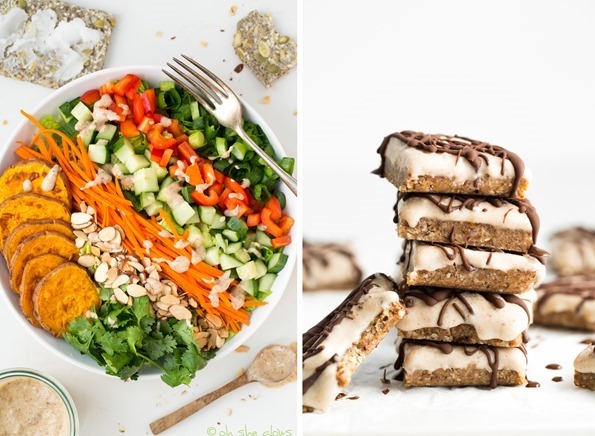 As I wrote at the beginning of September, my goal for Vegan Glow was to showcase wholesome, vegetable-heavy vegan recipes that energize and inspire you. Did it work? :) Given that it’s back to school/work season, I tried to share as many quick and easy recipes as I could. Most of the recipes I shared came together in 5-30 minutes. All in all, I think I was successful with my goals, cranking out more healthy recipes this past month than I have since before I started the cookbook. It felt a bit insane posting almost every other day, but I guess that was the point of the challenge! Vegan Mofo renewed my mojo for blogging and introduced me to many talented food bloggers in our awesome community. 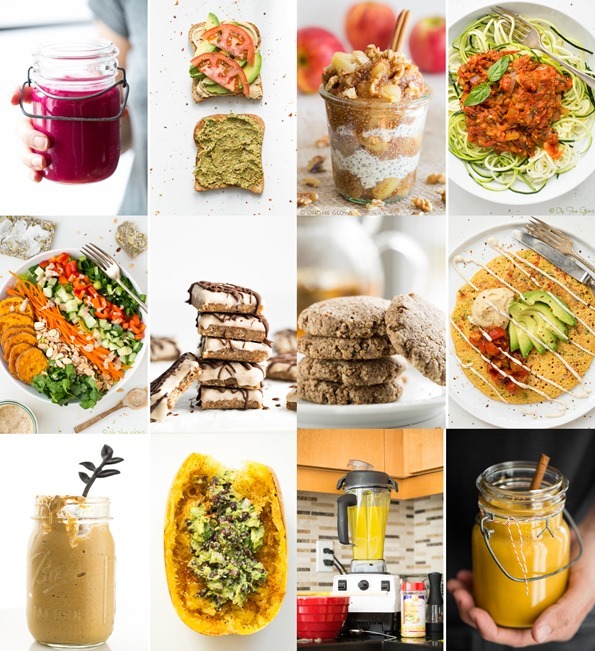 From raw recipes and smoothies to healthy desserts and energizing fall-inspired soups, hopefully my recipes this month inspired you to add more vegetables into your life! I always feel my best when I’m eating lots of veggies, so this challenge was motivating for me as well. As a reader mentioned in my first post, there’s plenty of time for holiday goodies in the months to come. True story. I’ll let you know at the bottom of this post which recipe was my favourite and which one was your favourite (based on amount of clicks the post received). 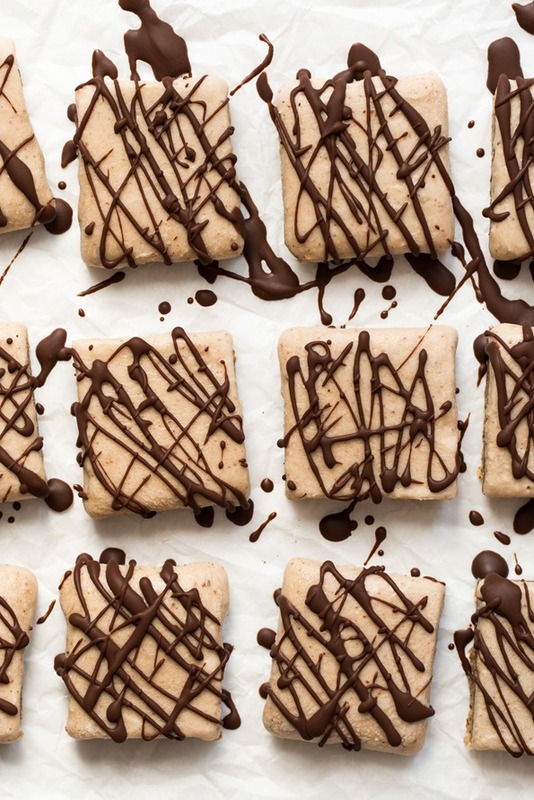 I’ve also highlighted some Veganmofo recipes that caught my eye throughout the month. Whew. What a FUN month! The most popular recipe of the month goes to…. —-> No Bake Elvis Bars <—– Elvis is rolling over in his grave no doubt. My personal favourite recipe this month is a tie between my Sugar-Free Apple Pie Chia Seed Jam + Parfait and Ultimate 4-Layer Vegan Sandwich. Holla. SO MUCH GOOD FOOD and so little time! My favorite were the Elvis bars! I made them and oh gosh they were so good!!! I really enjoyed you posting almost everyday. I am going to miss the daily post they were very inspiring. Thanks for all the posts this month! I always like visiting your website and making the recipes I find here. Last night I made an Italian themed delicata squash to go with my very exciting pasta and sauce (ha). Thanks for teaching me how to cook it! It was so cute and easy I will definitely be making it again! I can’t believe September has come and gone already! The Tex Mex Spaghetti Squash was definitely one of my favorites…I can definitely see it becoming a staple fall dish! Loved all your posts, thanks! Hi Angela! Just wanted to say “thank you” for all your great posts this month. I rarely comment but felt the need because I really enjoyed each new post. I made your chunky tomato sauce (twice! 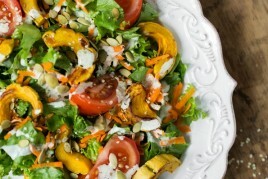 ), the almond-lime dressing in my own “big salad” and the pecan-pumpkin butter. All winners! I printed out the Elvis bar recipe for future use. Great work! Thank you Abby! It’s a work in progress hah. I have to say that the socca was my favourite. I’ve tried to make socca before and wasn’t impressed. I gave it anohter go last night, and I was soooo impressed! 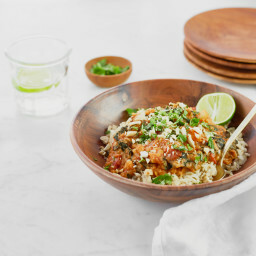 Thank you for another wonderful vegan dish to add to my repetoir. 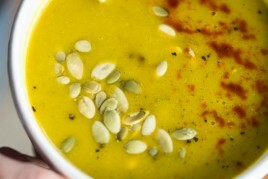 Notable mentions to the ‘cheesy’ soup which inspired both parsnip and ‘cheese’ soup, and cauliflower ‘cheese’ soup. Hi Emily, So glad you liked the socca! I didn’t have much success with it in the past either, so I can relate. So much beautiful food! The Pink Power detox smoothie has become a stand-by for me…love the flavours, and the colour always makes me smile! Awesome :) I know what you mean about the colour…I still can’t believe it’s all natural! I loved your frequent post over this past month! Now I just have to get on top of making a bunch of these… so many vegetables, so little time! I’d say those Elvis bars were my fave too, but desserts will nearly always beat out any other food (just take a look at pinterest ;) ). 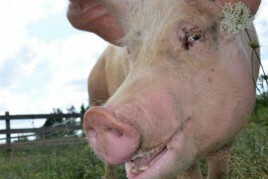 Thanks for the links for the other Vegan Mofo participants. I didn’t follow much of it–but like you, it’s always fun to find new blogs. I love all the recipes you posted this month, but I think my favorite is the sandwich. So simple yet incredibly delicious. Also, thank you so much for mentioning the Lime-Mango Sherbet I shared on my blog!! No problem :) I can’t wait to make it! Thanks for all of the gorgeous food posts this month. I’m sure it took a ton of work but I loved checking your site every day! 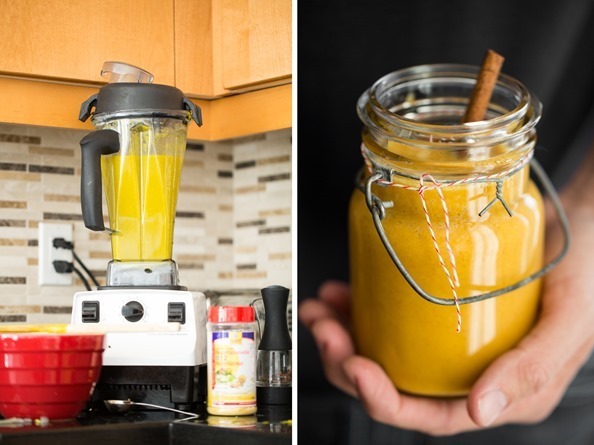 The tex mex spaghetti squash is going to be a new favorite for me and I’m excited to try your butternut cinnamon smoothie! YUM!!! I have a jar of the 7 vegetable soup waiting for lunchtime right now. So good and the first time I’ve used nutritional yeast. Definitely going into regular rotation. I’m planning on trying the pink smoothie next. Thanks for the recipes! Wow, it has been a whirl wind month! For me, I have cooked everyone of the nutrient dense meals you created for MoFo! Thank you, the leftovers are bountiful, and no cooking until they are all gone. It will feel like I am on vacation. All of them will be added to my collection of fav meals to make, and devour!! 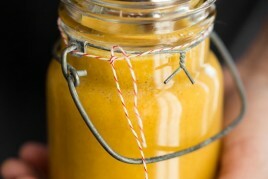 The ultra creamy hemp salad dressing is going to be regular topping for everything. Ha! Seriously??? wow!! That’s amazing…I’m in awe. Thanks so much for trying them out! All of these look. so. good. I can’t believe I haven’t tried them yet. But that chopped salad is calling my name. I’m getting hungry just thinking of it. I loved this month on OSG!! So many amazing recipes! I made half of them!! It’s been awesome seeing more posts from you this month and it felt like such a gift to have you back here more often :) I have loved seeing the recipes, and seeing all your photography – so many recipes and photos in one month compared to your more recent pace – and it’s just been mindblowing to see how amazing your photography is, Angela! Thanks for indulging us all in a great month! Love your take on vegan meals. Like you said, quick and easy. I tried your Tex-Mex Spaghetti Squash with Black Bean Guac – Delish! I have the Jumbo Chickpea Pancake earmarked to try next. Thank you for the inspiration and the tools to make it happen. Love love love all the posting you are doing, keep them coming talented woman! I loved you month of vegan food. I think that you did an excellent job showing how easy and delicious eating a plant- based diet can be. Your recipes are inspiring and I love seeing them! I really really enjoyed the back to back recipes this month! It went by really fast.. The 7 veggie soup was my favorite, although I really like some of the others too. 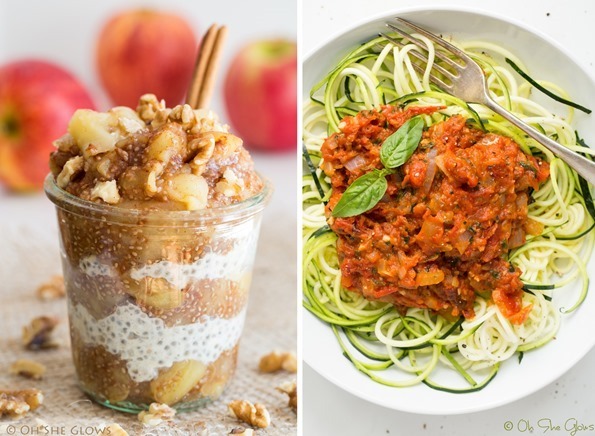 Thank you for so many wonderful recipes, I have been making one at the time, and each one is as good or better than the other one, the apple chia jam parfait was one of my favorites, but I also loved the tomato sauce from scratch that I paired it with spaghetti squash …was wonderful to see so many yummy recipes this month! Thant you again ! Thank you so much Angela. I have been enjoying your website immensely. Keep up the awesome work! Thanks for sharing my Kale & Garlic Scape Hummus :) It was definitely a winner! I have REALLY LOVED all the recipes you’ve posted this month, they all look TO DIE FOR and I have a big queue waiting for me on Pinterest! I can’t wait to make that hummus…next time I get my hands on some scapes it’s going to happen! I made a pesto with them before and it was killer. Might have to add some basil too! I know it’s going to be a while for fresh scapes, but I managed to get some pickled scapes from my veggie box folks, so I’m going to give it a go “off-season” :) Basil sounds like a dream added to the hummus. Garlic scape pesto is one of my favourite things. I’ve got some in the freezer for when we hit the dead of winter and need a little pick-me-up. I swear, we had so many ideas we could have done a year of hummus… but happy for a little hummus break right now, and we’ll do more hummus recipes on the blog in the future for sure. 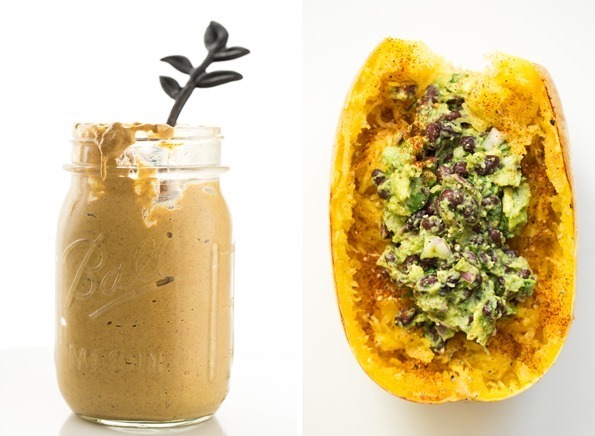 all of this looks amazing, but that raw pecan pumpkin butter would totally hit the spot right now! I loved following along, Angela! Since vegan MoFo now over I can get cooking! Holy cow. I feel like you were just saying that you were going to make it a goal to participate in MOFO this year and Eric doubted your abilities… Haha. You did an awesome job and produced some spectacular recipes! Whew, vegan MoFo definitely made me hungry like ALL the time. I have so many things that I wanna make now including your no bake Elvis bars. Thanks so much for including my link! It is much appreciated. All of these looked amazing — I think my favourite though was the ultimate 4 layer sandwich — combined 4 of my favourite foods! I loved every one of your September posts, Ange! You did such a great job on each and every recipe, and it was so great to hear from you so regularly again (although I totally get why you needed the break! You’ve been a busy lady!!) I’m still drooling over the no-bake Elvis bars, and the butternut smoothie is on my list of must-try fall drinks. I’ve been smoothie-ing like crazy lately! Just wondering if you could help me with my metaphysical thought of replicating Earth Cafe vegan cheesecake found at WF any flavor. Thanks – Namaste and all the other beautiful celestial salutations to you and your energy! Oh my, my, my. Too much good food in one place. I will definitely have to give the Elvis bars a try. Delicious. Congrats on finishing your first MoFo! I can’t believe September is over either. This was my favorite collection of posts you’ve ever done! I mean, I’m an avid reader and love all of your stuff, but I think I pinned almost all of these as they were posted. 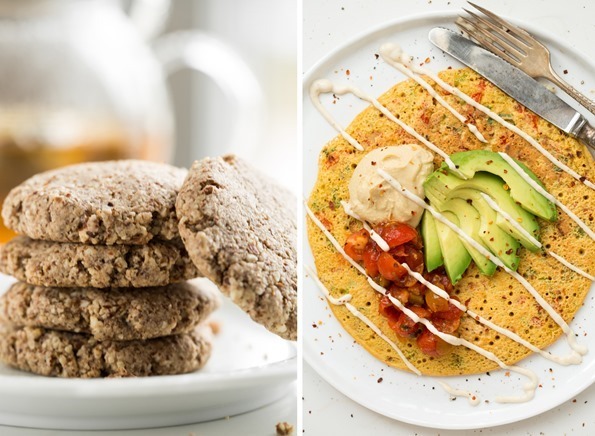 I’m not even vegan, but am a true veggie lover and tend toward a vegan diet by preference (except for eggs… gotta have ’em), so these recipes blew me away! One question about hemp seeds/hearts: Where do you buy yours? I need to check the bulk bins at Sprouts and Central Market to see if they carry them. 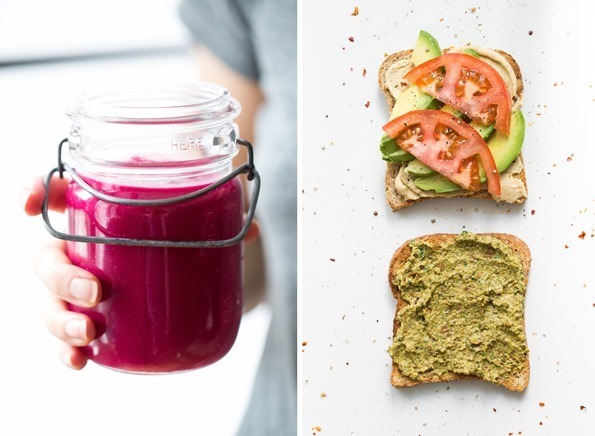 I want to make the veggie sandwich with the hummus! 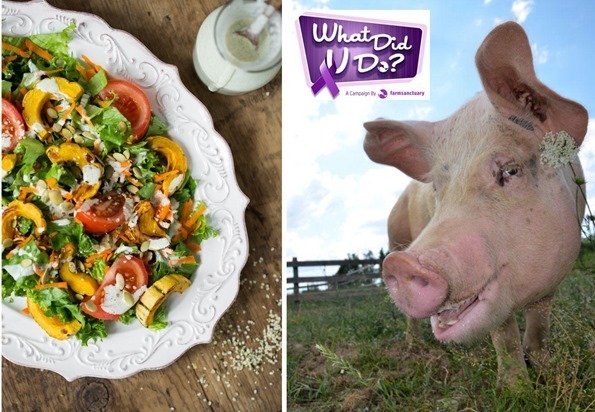 Thanks so much for all of the delicious recipes and congrats on hitting your goal. Sadly I didn’t get to make them all, but I tried hard and managed to get through a good chunk of them – the smoothie (several times!! 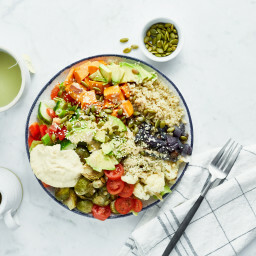 ), the hummus (my favourite – oh so good), the tomato sauce, the raw pumpkin butter (good on apples, and better on pancakes), the apple pie chia jam (also good on pancakes and oatmeal), a slightly modified version of the chopped salad and last but not least the squash salad is in the fridge ready for lunch tomorrow. Phew! I’ve made the tomato sauce on zucchini pasta at least 3 times…. definitely one of the best sauces I’ve eaten so far! Your September posts were so much fun!! Thank you Angela! I am so excited for your cookbook launch, can hardly wait until March! Will your cookbook be available through your site as well as through retailers in Canada? Thank you Carol! Yes, it will be available in retailers in Canada like Indigo, Chapters, etc. I just had to say I love your website. Im always telling my family that they need to check out your recipes. Your amazing! Thanks for sharing so much great stuff! You’re photography skills are nothing short of amazing. I can’t wait to try all of these amazing recipes. I definitely have my eye on the apple pie parfait! I love pasta so my favorite was absolutely the tomato sauce, so yummy! Your two favorites of the month were also my two favorites! I’ve made both the Apple Pie Chia Seed Jam and the 4-Layer Sandwich over and over this past month…so so good! I am a new vegan (just about two months now! ), and your blog has been so incredibly useful with this transition. Thank you so much for all of your delicious recipes! !